To mark 50 years since the tracks were recorded, Pink Floyd have released a limited edition set of two 7″ singles, containing the band’s first recordings. 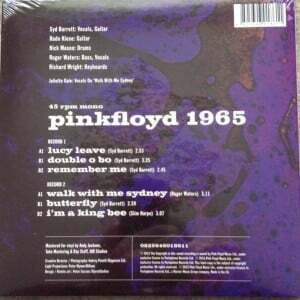 Entitled Pink Floyd 1965 – Their First Recordings, the songs include Syd Barrett compositions Lucy Leave, Double O Bo, Remember Me, and Butterfly, coupled with Roger Waters’ Walk With Me Sydney, and I’m A King Bee by Slim Harpo. These recordings have been doing the rounds on unofficial bootleg recordings over many decades and it is great that fans can now buy a version of them in the glorious vinyl format. Many people will be very pleased indeed. The band lineup was the original quartet of Syd Barrett, Roger Waters, Nick Mason and Richard Wright, augmented by Rado Klose on guitar, and, on Walk With Me Sydney, Juliette Gale on backing vocals. The package includes two 45rpm 7″ singles contained in a gatefold sleeve designed by Peter Curzon of StormStudios, based on Hipgnosis Creative Director Aubrey Powell’s photograph of a light projection by Peter Wynne-Wilson. The audio was mastered from the original mono analogue tapes by Andy Jackson of Tube Mastering and Ray Staff of AIR Studios. Stories on the internet say the release was shipped in Black Friday packages to some retailers so you would have to do some sniffing around. Its not on Amazon or the other main retailers so please leave a comment on the story if you know where to buy them! You may also want to enjoy some Pink Floyd 1965 photos from the massive Pink Floyd gallery we have on the site. Enjoy.